A super-soothing colour palette makes this renovated villa something truly special. 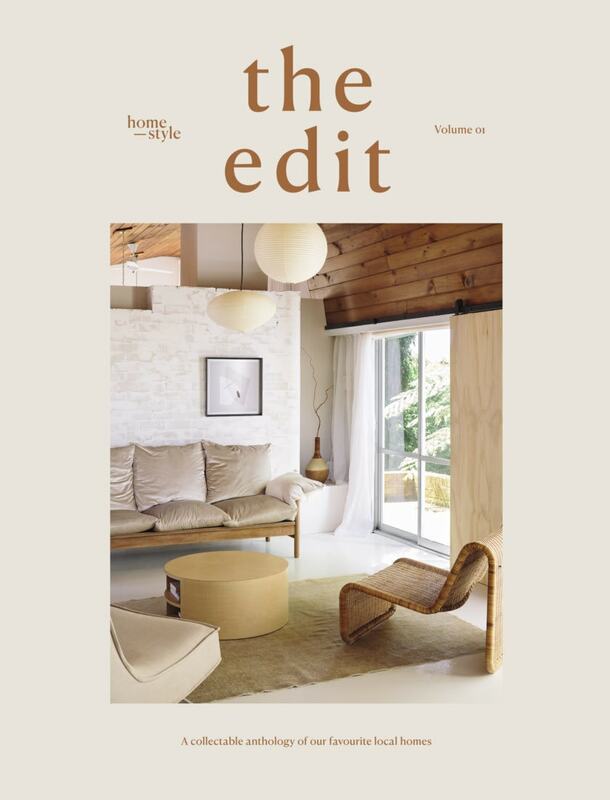 When the new owners of this Mt Eden, Auckland home bought their property, they called on interior designer Tomi Williams of Indigo Design to help them come up with a more soulful solution than those seen in many of the suburb’s ubiquitous villa renovations – one that honoured their family’s heritage as well as that of the classic dwelling. DINING The custom-designed hallway doors are one of Tomi’s favourite features and are based on an image she came across during her research, of a man walking in the dappled light created by a row of patterned screens. The Romana extendable table by Ercol is from Good Form. The original 100-year-old villa had been split into two flats. One was very run down, with pink walls and a lean-to at the back that housed a tiny kitchen and laundry opening onto the garden. The other, at the front of the house, was in a slightly better condition, but was also the worse for wear and suffering from a number of spatial challenges. 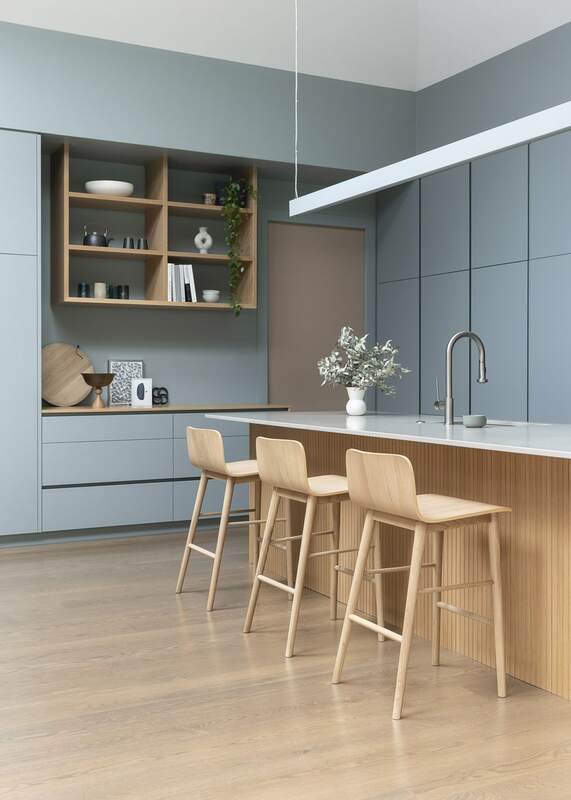 TOP In the kitchen manufactured by Neo Design, a custom-painted strip light by Lightplan illuminates the Diamondstone Crea Breton benchtop and oak veneer island, with Tam bar stools from Bauhaus. 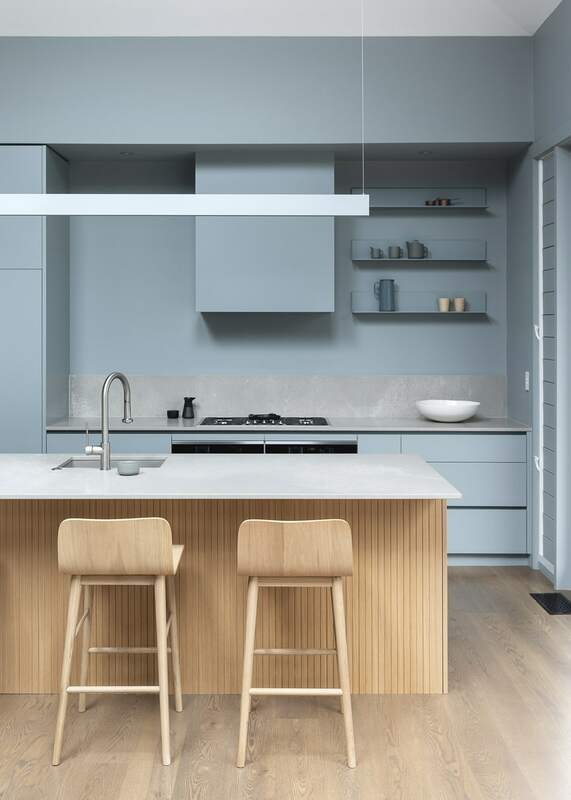 The shade of the cabinetry and rangehood was matched to the walls in two-pot lacquer Dulux Rangitikei River Half. 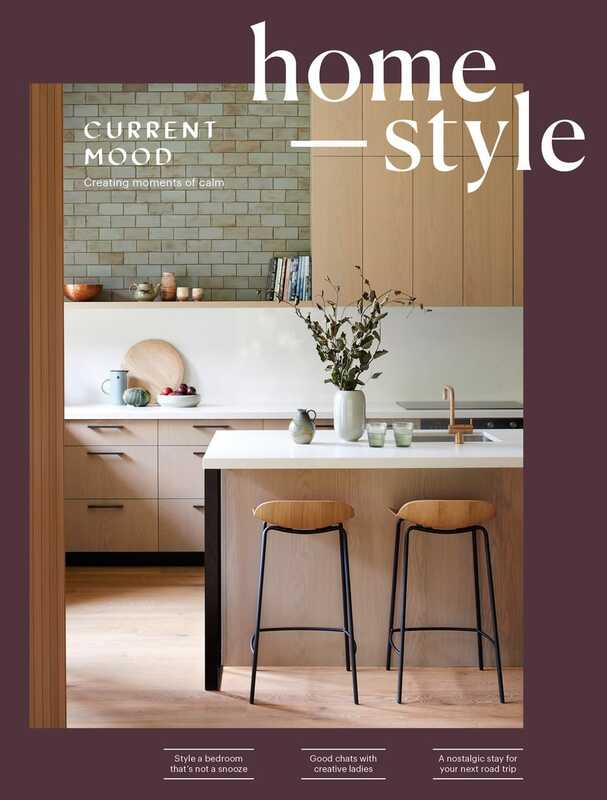 Seen on the shelves are tonal accessories including a tea set by Normann Copenhagen from Backhouse, and an enamel jug and wooden cups from Everyday Needs. 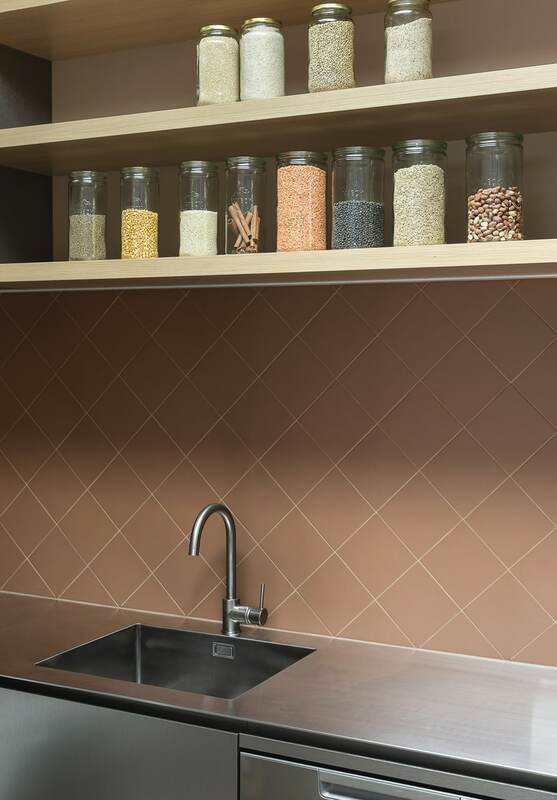 ABOVE The pantry’s shelves display jars by Weck from Father Rabbit that hold spices and drygoods – the colour inspiration for the Antilia tiles from Artedomus and Prime Laminate in Brushed Stainless Steel. and living space with easy access to the • backyard, and scope for an outdoor kitchen down the track. TOP The armchairs from Bauhaus match the sofa and walls, which in turn blend with the bespoke metal shelves by Indigo Design. 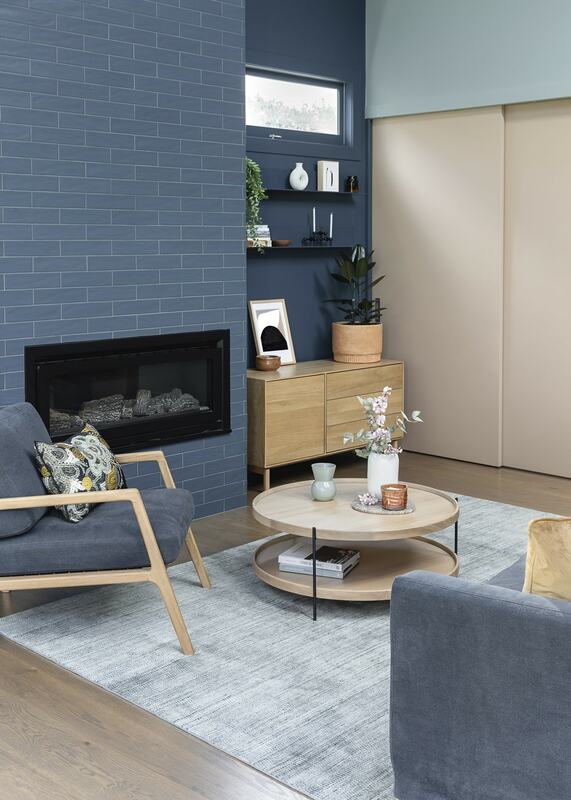 Here, the colours of the walls in Dulux Rangitikei River Half and sliding doors in Dulux Indian Clay are complemented by the furniture, including the sofa and Humla coffee table from Bauhaus, pale ceramic vessels by Gidon Bing from Good Form and Riviera rug from Artisan. 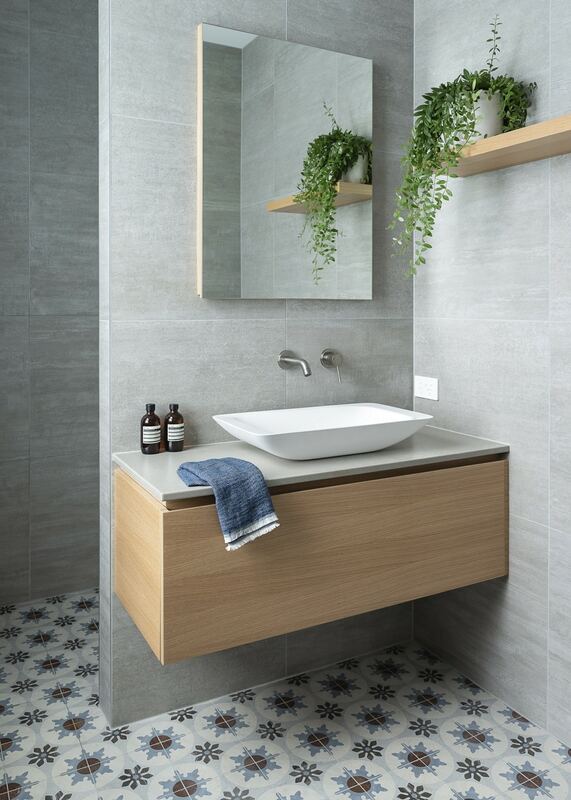 ABOVE The powder room provides a glimpse of pattern and colour as you walk down the tranquil hallway, thanks to its Louise Body Paper Tiles wallpaper from Paper Room and Shui Comfort basin by Ceramica Cielo for Casa Italiano. The pendant light is by Tala. The villa’s solid bones allowed for its framework to be maintained, while character details like the bay window in the master bedroom and the new verandah at the front of the house were added to reinstate some of the original integrity. The front flat was updated with a kitchenette and ensuite, so it can be used by guests and the family’s au pair. TOP Part of the updated self-contained flat, this bedroom connects to a living room and kitchenette. 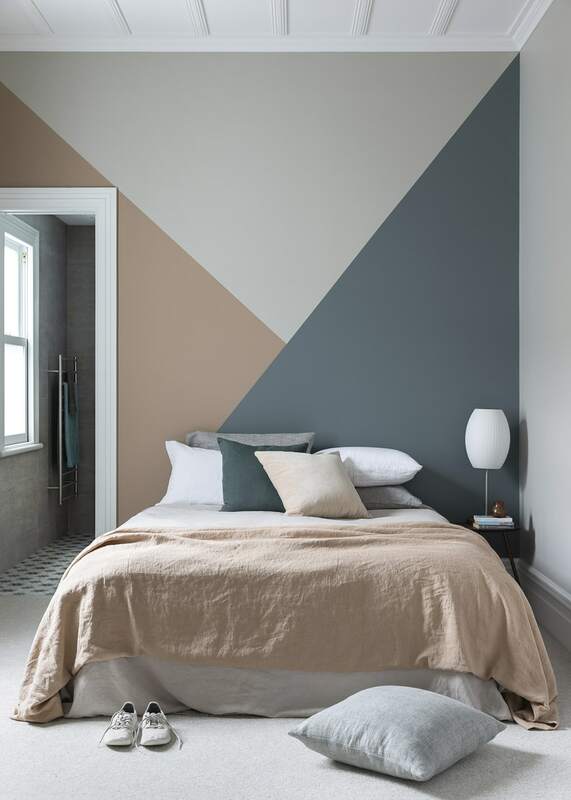 Tomi saw an opportunity here to create a graphic feature wall using shades seen in the main house: Dulux Mt Eden, Dulux Indian Clay and Dulux Rangitikei River. Stonewashed linen by Mokum from James Dunlop Textiles is used as a throw on the bed with a duvet, pillowslips and cushions from Città. ABOVE The ensuite features cabinetry custom-designed by Indigo Design and made by Neo Design from the same materials as the kitchen island, plus a Mojo basin by Metrix. The Cementine 20 floor tiles are from The Tile People. Colour plays a significant role in this abode, and although the palette isn’t one you’ll find in many updated villas, it tells the story of its inhabitants so well. From the soft grey-blue kitchen cabinetry and walls, to the denim-blue tiles around the fire and the inky linen curtains in the master bedroom, Tomi’s eye for combining subtle shades has imbued the interior with a relaxed ambience and a calming, understated luxury. “I started by researching modern Indian interiors and fashion, which highlighted the strong use of blue and terracotta,” she says. Reconfigured bathrooms and a new powder room explore Indian and industrial references through decorative wallpaper and tiling. “The challenge for this project was to make sure the use of pattern didn’t clutter or detract from the overall aesthetic,” says Tomi. 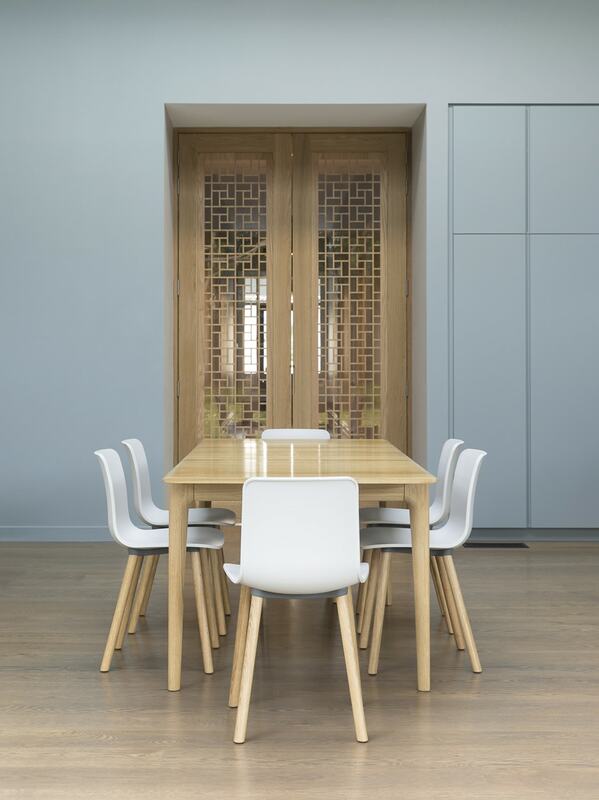 “To achieve this, I incorporated it in isolated areas where colour isn’t a strong feature. 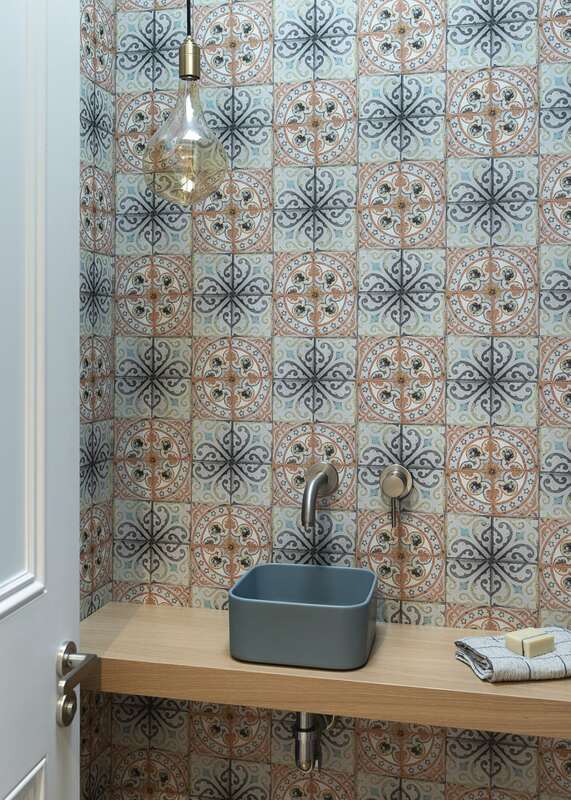 The tiles in the bathrooms and wallpaper in the powder room were selected for their use of hues that are seen elsewhere in the house, to ensure everything works harmoniously together.